Last year, I had planned a two-week trip to Europe for this summer, mostly in and around Paris. Three months ago, I was flipping through the channels on a Saturday and came across PBS which was doing a pledge drive. They were doing a marathon of Rick Steves‘ Europe Through The Back Door episodes and I got hooked. 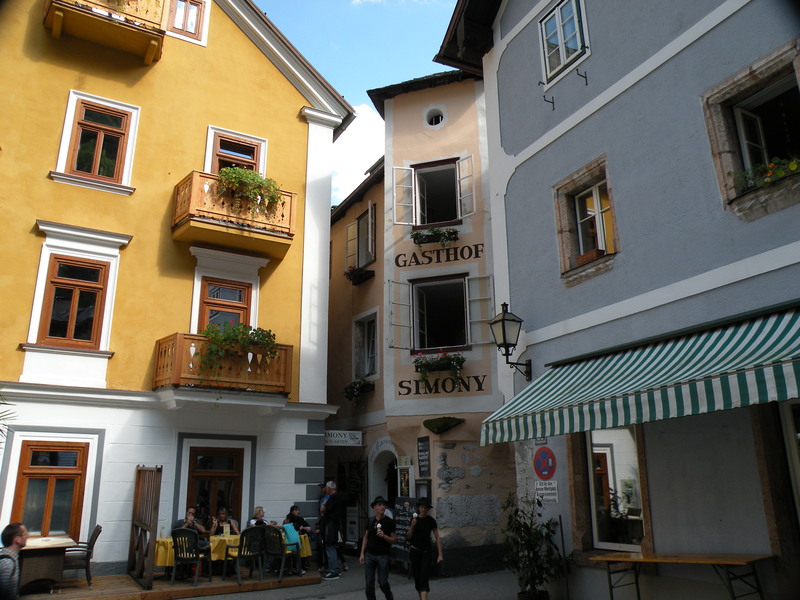 One of the first episodes that I watched that weekend featured Hallstatt, Austria. It looked so enticing; I decided I must go there. 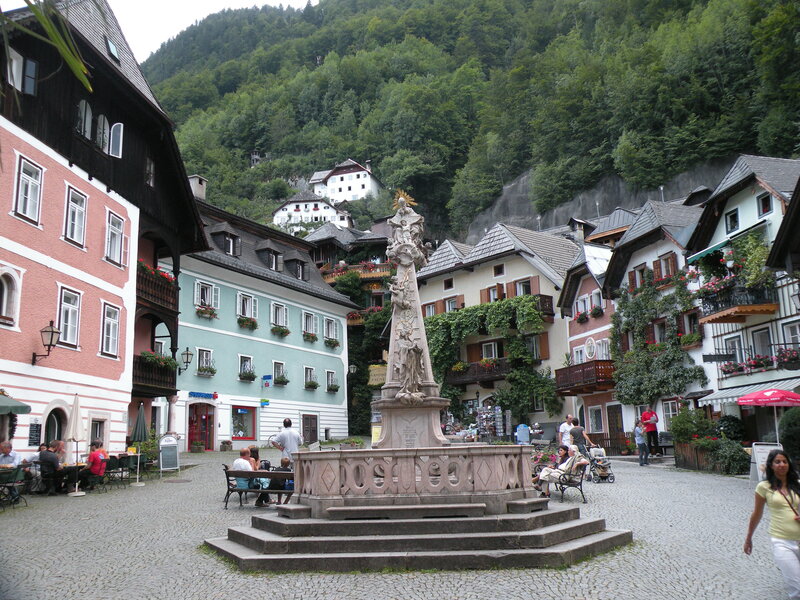 I saw several places that looked great, but there were two that really got my attention, Hallstatt and the Cinque Terre in Italy. But Hallstatt was the first that spoke to me. It struck me as a place I could have several of those “perfect moments”, a place where I wouldn’t be able to think about other unimportant matters even if I wanted to, a place that would be a pure escape. 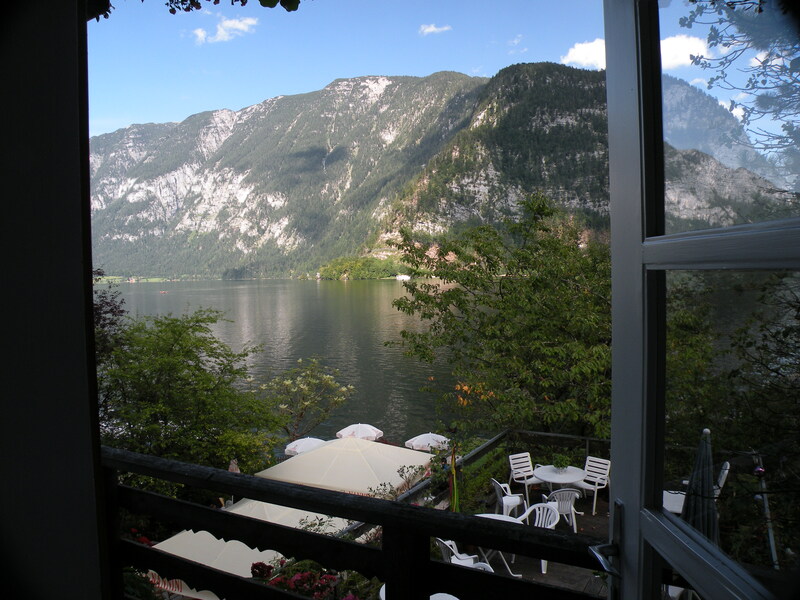 I did some research on the web, read Rick’s guidebooks and made a booking at the Gasthof Simony for a lakeside single room with balcony for two nights on August 14 and 15. Today is August 14. I woke up at the Salzburg Youth & Family Guesthouse Hostel, showered, had breakfast, checked out, and then sat back down in the lobby to research some places in Switzerland. 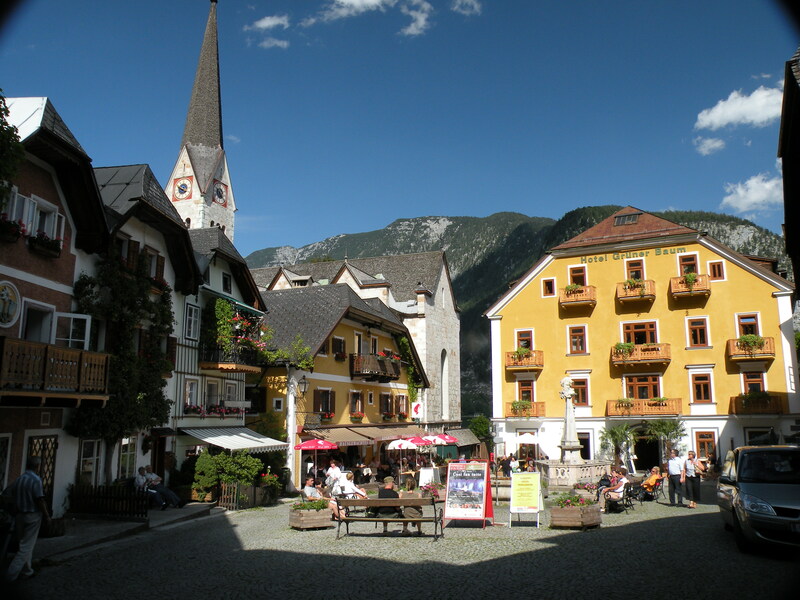 You see, Hallstatt is the last location that I pre-booked before starting this journey, so I needed to have a quick look on the web while I knew I had a good internet connection, make a couple of calls and book something for at least a couple three nights. 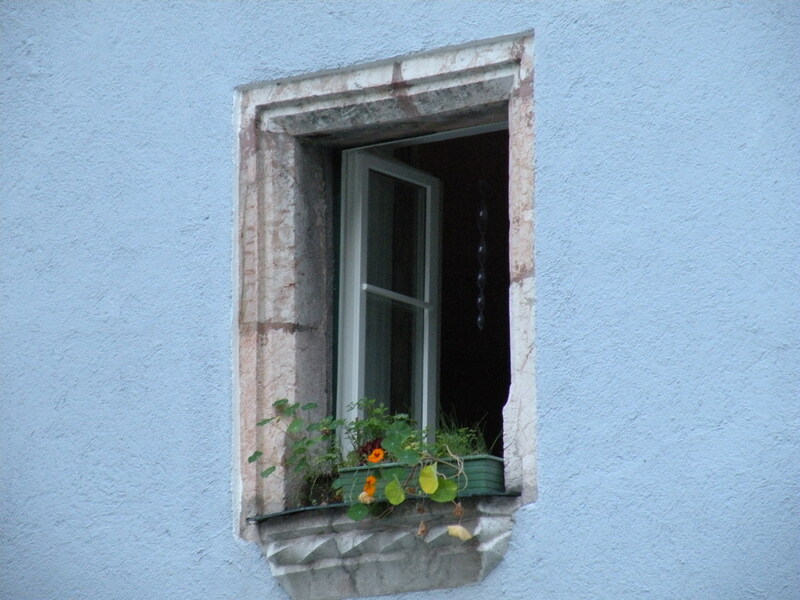 I’m extremely anxious to get to Hallstatt, which is only 78 km away by the way, but these things can’t be rushed. They must be savored, like a fine cut of beef or a nice wine or whatever your favorite decadence. I left Salzburg about noon, not really feeling good about it either. I didn’t really get out and see things and so I feel I wasted an opportunity. 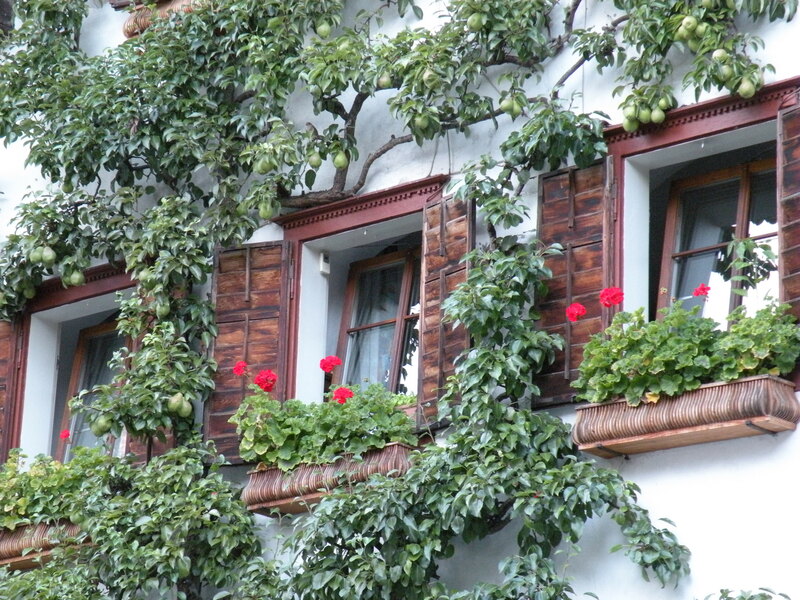 Salzburg is a lovely city, and today is wonderful weather, blue skies, with just few white puffy clouds. It’s my own fault though. It’s an excuse to come back some day I guess, I really would like to see more of the town. So, a 78 km drive. Well, that just won’t do. 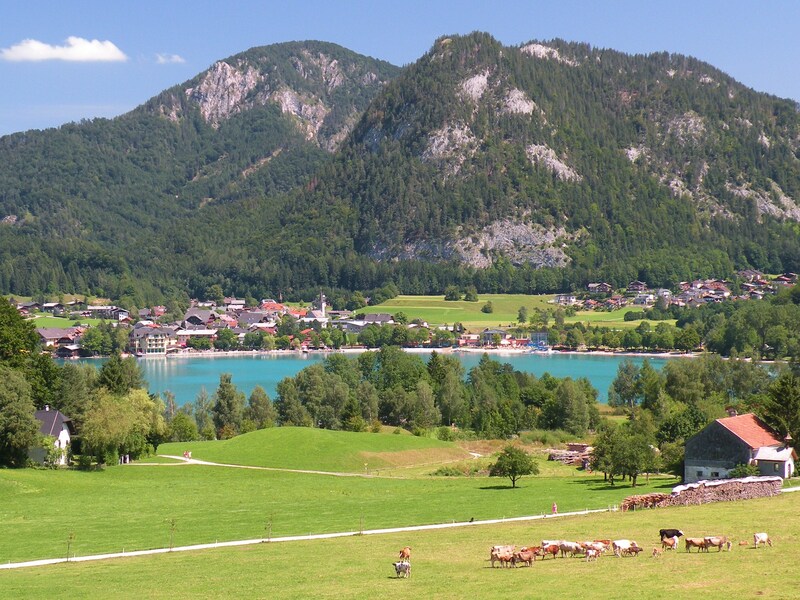 I picked a route that would take me through the Salzkammergut Lakes District, of which, Hallstatt is a part, but I took the long way. I took four hours, stopping at a few towns and villages along the way. This region is marvelous, so many lakes, and towns perfectly situated on those lakes, so that when you come around some bend in the road, the scene strikes you, and it strikes hard. One of the first I came to had this wonderful turquoise bluish green color water. Of all the lakes I saw, it was the only one that had that color. I picked a nice spot and had my picnic lunch with bits that I’ve collected over the last couple of days. It was quite nice, quite relaxing, I was in no hurry, even though the excitement was building. I set off again and made a few more stops along the way to take pictures and enjoy the views. These mountains are not huge by any means, but they are beautiful in their arrangement and form, with just the right combination of exposed rock and forest growth. They’re beautiful with the lakes and towns set in and amongst them. All of it together make the scene. The sign said Hallstatt 13 km, the next said 9 km and the next 4. I actually stopped at a roadside pull off 4 km from my goal to take a picture. I couldn’t get to where I needed to be for the angle I wanted without getting a little wet and so I said forget it, go to Hallstatt, what are you waiting for? As I closed the distance, I wondered if I had built my expectations up so much that I would be disappointed. Whatever happens happens I told myself. I’ll just make the best of it and enjoy it anyway. The anticipation grew. I worked hard to get here, I did the research, the journey has been long and I spent the money; I was actually choking up a bit, probably because of the money though. I’m such a big baby. I came around one of those bends and I saw some buildings. 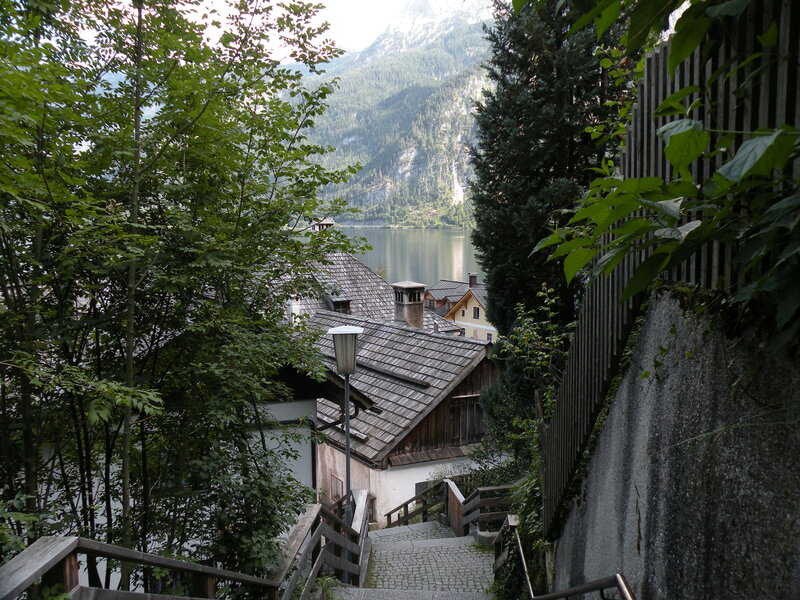 I wasn’t sure if it was Hallstatt or not, I had only seen pictures of it from the lake. Hallstatt is built into the side of a cliff, so my perspective was all messed up. There is a road that goes by it, but it’s in a tunnel that’s been carved through the cliff itself. All of sudden, I was in that tunnel. Cars are not allowed in the town proper so I had to park in what they call platforms, which I did. I got my pack on, locked up the car and headed down some stairs. A lot of stairs. 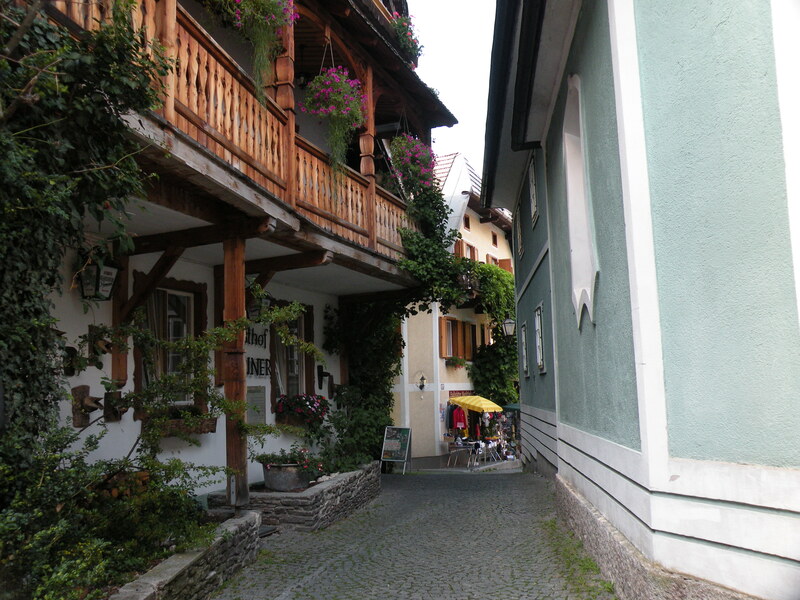 Then, I was in Hallstatt. 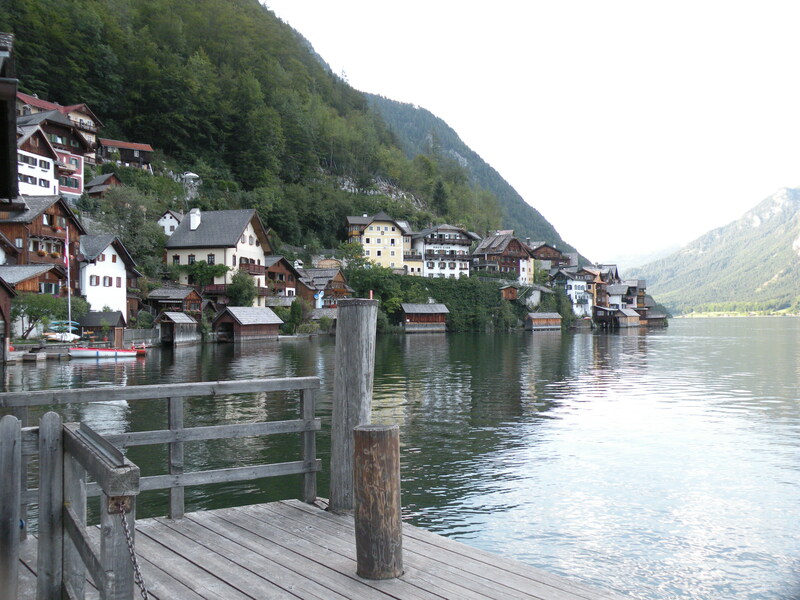 I still can’t see the scene as I know it from the lake, but this was Hallstatt and I recognized it. I walked down a couple of lanes, slowly so as to savor it. I turned a corner and I was in the market square. Magnificent. I’m so digging this. 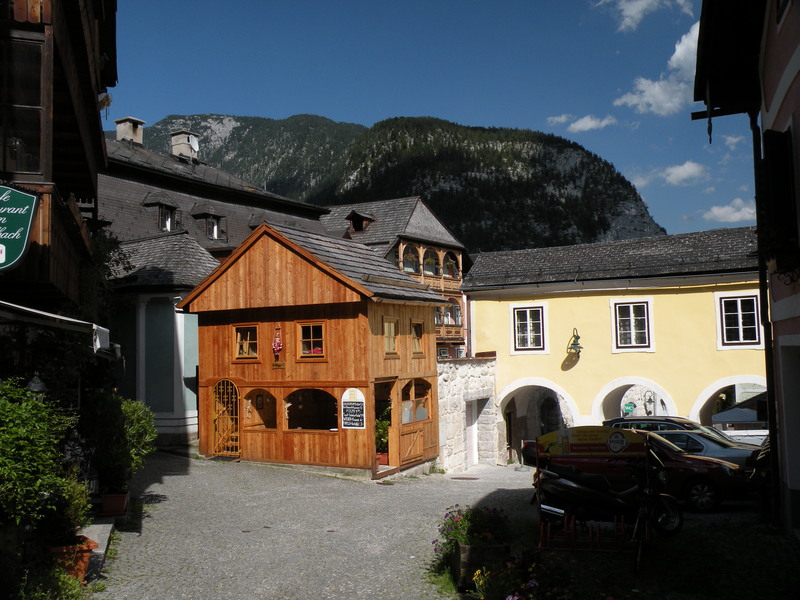 Hallstatt and its salt mines were here long before Christ, long before the Romans even. The local tribes mined the salt deposits here 7,000 years ago. It’s had its share of disasters and keeps bouncing back, even after its existence had been long forgotten after a rock slide had completely wiped out the town and the mines. I surveyed the market square and in one corner I saw the words “Gasthof Simony.” I walked in and Frau Sheutz greeted me. I greeted her and introduced myself, in German mind you, and she directed me to my room. Funny thing these European hotels. So far, I walk in, they show me to my room and that’s it. No paper work, no waiting at a desk, no paying for the room, no key even. The key is in the door waiting for me and the keys are those old timey keys that go into key holes that you can see through; cool. So, I trekked up the very creaky stairs admiring the antiques that filled the place and found my room at the end of the hallway. I opened the door and the room was perfect. It’s so cozy with wood floors complete with creaks, antique bed, table and wicker chairs and a wooden armoire built into the wall and a chest of drawers with a marble top. The single bed has a wonderful wood headboard and footboard, maple I think, nice white linens, two big down pillows, and a down comforter. I sat on the bed for a moment and it felt pretty good. I didn’t dare lay down yet though. If it is a comfy bed I want to save that discovery for later and if it’s not comfy, I didn’t want that to ruin the moment. 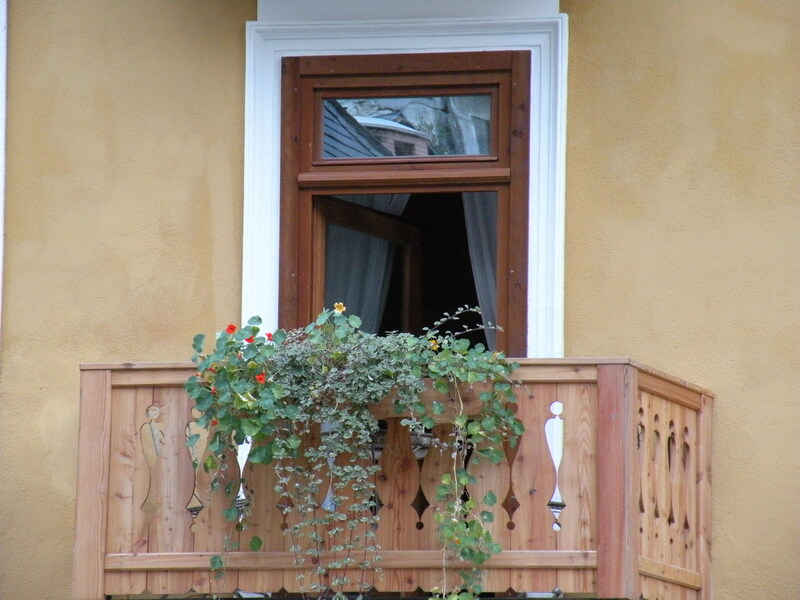 At the far end of the room is another door, already open to the balcony. I dropped my pack and went to have a peek and I’m treated to a most amazing view of the lake and the mountains. I am so digging this. Covering the outside walls and hanging above me is some sort of ivy. Just below me and jutting out toward the lake is a deck with tables and chairs with plants and flowers, it’s their garden area. Below that and to the left is the water’s edge back yard, which is used for the restaurant seating. I had a seat on my balcony and just sat there for an hour in awe; just watching what went on around me. Some small boats on the lake, meal preparations in the restaurant, people chatting, the train arriving at the station across the lake and the “Stephanie” going across the lake to pick up the latest arrivals and bringing them back. I am so digging this. My new neighbors arrived and I watched them go through what I just did. They ooh’d and ah’d and took some deep breaths and glanced around rapidly trying to take it all in and then they smooched for a while. They saw me and greeted me with a Grüß Gott, which is the typical Austrian greeting which loosely translated means may God greet you. I went down for a meal and was given a table at the water’s edge. A couple more steps, wet. I ordered the daily special and a beer, jeez that’s number five. While I waited for the meal, a couple of swans came by to say hello, some kayakers paddled by and I just took a deep breath and relaxed because I made it, I’m in Hallstatt. So far, it’s exceeded my expectations. 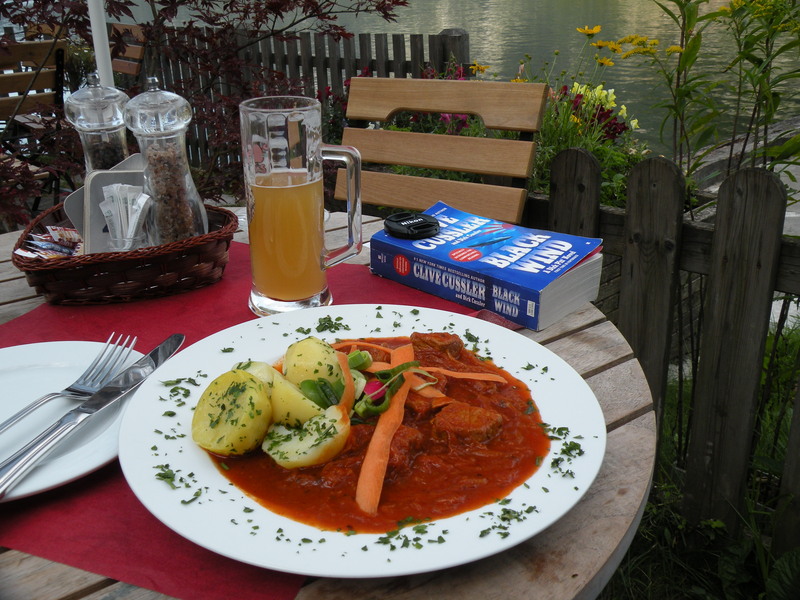 The meal was a very tasty cream of vegetable soup followed by a pork, cabbage and potato stew and ice cream for dessert. Sehr gut. Another odd thing, in European restaurants, the waiters don’t bring the bill for a long time, if ever. I’ve had to ask for it each time. I wait longer each time to see if there’s a threshold but I haven’t reached it so far. Europeans just hang out for a long time after the meal, so I’m trying to get in the swing of that. After the meal, I took a stroll though town and then sat on a bench in the market square for a while. Then returned to my room to write in my journal. It’s about 8:30, the sun has dipped below the mountains and I’m listening to the sounds of the town winding down the for the day. It’s delightful. I am so digging this. As far as I have seen, Austrian streets are clean everywhere! three hours and I would be there (again)! 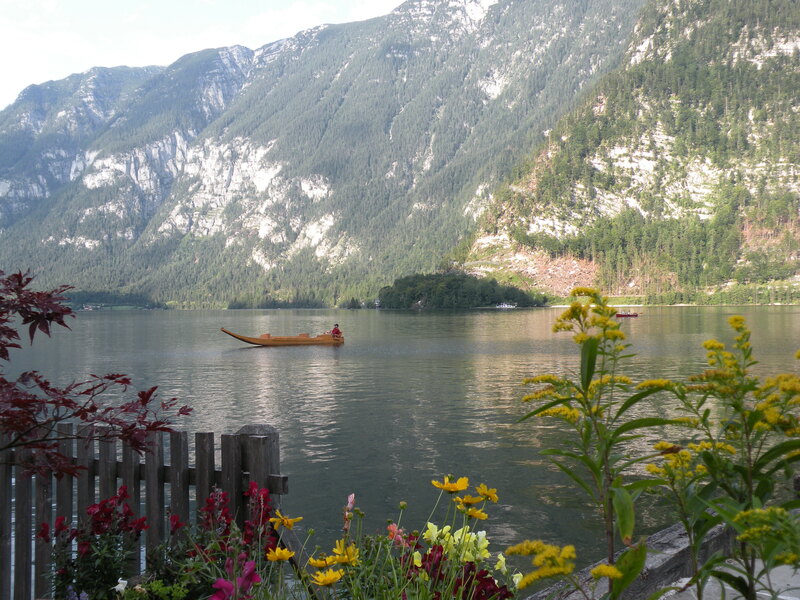 I simply love the Salzkammergut. 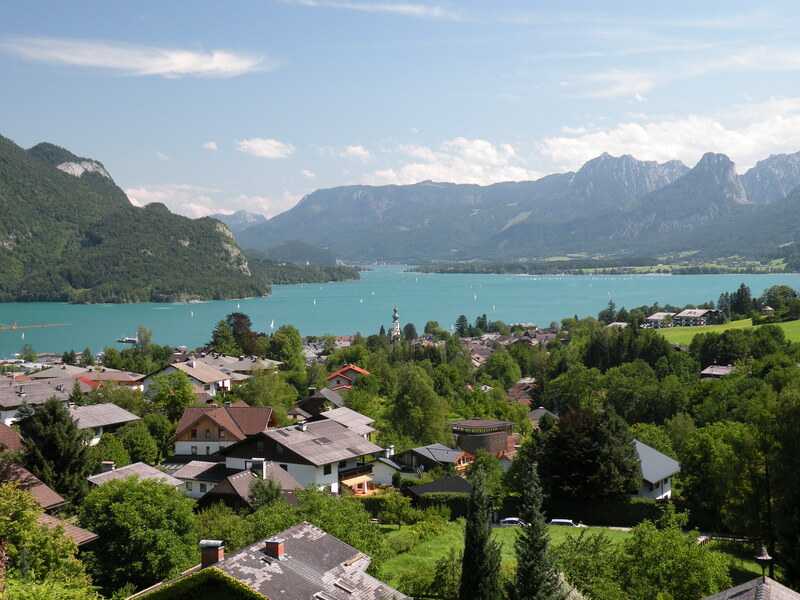 I spent my childhood summers with my grandparents in Salzburg and many weekend trips to the lakes. 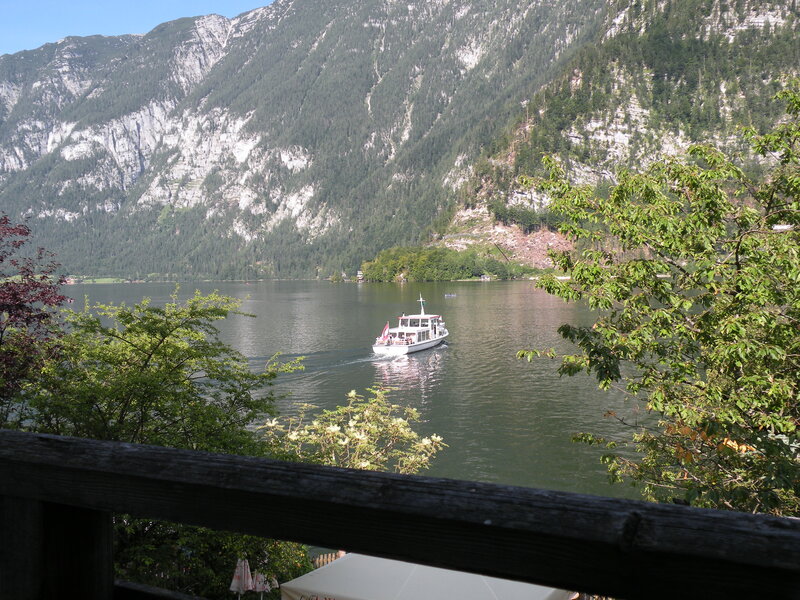 I moved to Vienna in late summer 2005, and I am enjoying every little excursion to the Austrian countryside (I was in Hallstatt a year ago, took that funicular up to the mountain behind the town, and hiked down – breathtaking views of the lake, some pictures of that on my blog). 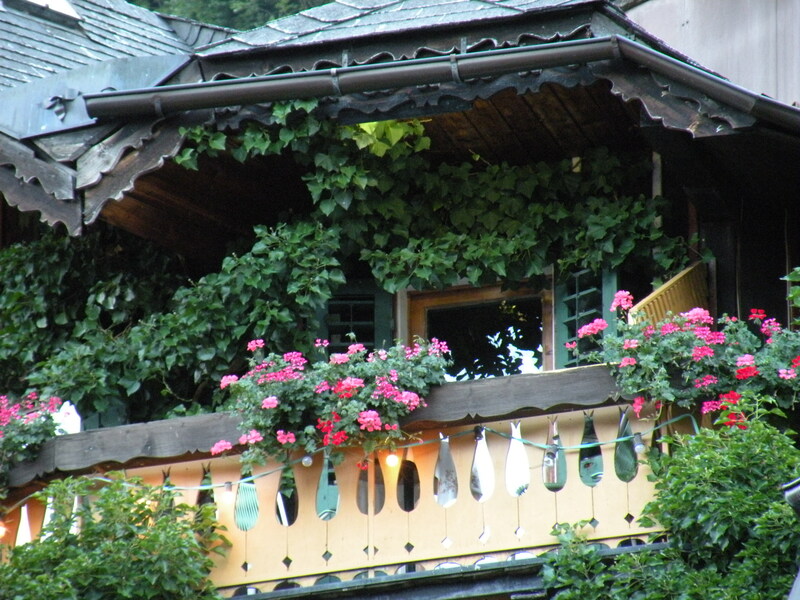 You definitely have to come back to Salzburg, a walk in the early morning along the Kapuzinerberg, past Nonntal, or in the evening, when you can hear the music rising up into the hills from the Festspielhaus below, magic! 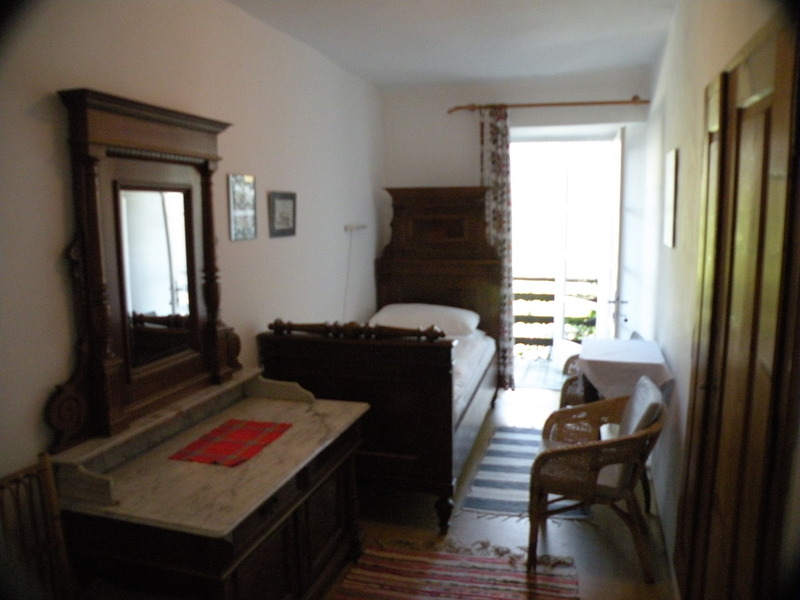 Take not of having lunch at the Heuberg, views over the city and the hills towards the lake region, a dream! I have to finish the birthday cake for my son and then we go out to the country for a barbeque. The tourist streets are certainly that clean. In Paris I saw some streets not so clean, kind of like you’d see in Seattle. Brussels wa probably the wrst so far, kind of grungy and dirty. Most of the place I’ve been so far, even the not so touristy areas, were pretty clean. I’m so glad that you’re having such a wonderful, delightful and relaxing time. I’m somewhat envious. I hope someday Ken and I will have the nerve to be as adventurous as you’ve been. Are the streets in most of Europe as clean as they look from your pictures? Ken and I both have commented on how clean the streets look, sort of like Disneyland. Take care and keep savorying of moment.